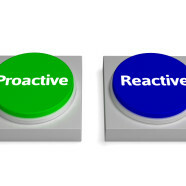 Home »Career Assessment » Proactive or Reactive: Which Word Describes Your Approach to Career Development? When you make career related decisions do you view them more with an eye on the immediate or find yourself viewing the decisions at hand as they relate to a larger lifework perspective? As a career counselor I encourage my clients to look beyond any current career decision fork in the road to consider the impact of their immediate choice not only on the situation at hand but on a total lifework experience or the body of work that will be produced over their lifetime. Thinking beyond the immediate decision to its long term impact can have two completely opposite effects. On one hand, highlighting the importance of how the immediate decision will indeed have a bearing on the rest of the decision maker’s life can be downright overwhelming. And yet, at the same time, it can provide a sense of relief at the realization that where this one seemingly monumental decision is actually the first of many such decisions that will be made throughout one’s lifework, there will likely be multiple occasions to reevaluate and perhaps course correct as needed and/or desired. And the sooner the decision maker realizes the latter is true the sooner he or she can begin the process of being a life-long, active participant in their own career development. The quality of the journey along one’s career path can absolutely depend on the degree of continuous engagement in their own career development process to which they commit, taking action rather than simply reacting to circumstances as they present themselves, as often and consistently as possible. It depends on making conscious choices and taking responsibility for their outcomes. It requires being proactive throughout one’s lifework journey. It is with our dedication to facilitating and promoting such proactive career development in the state of Illinois that we, the Board members of the Illinois Career Development Association (ICDA), last year in celebration of National Career Development Month, created Five Steps of Proactive Career Development. And in my desire to assist you in taking these first important steps toward your lifework path, I’ll share them with you now and plan to expand on them individually in future blogs contributions. And, here they are. Assess your interests, personality type, transferable skills and values. Gather and maintain current, accurate and comprehensive information about your chosen field. Develop and sustain a clear focus or mission for your life’s work and re-evaluate regularly. Network in person and via social media throughout your career. Be a life-long learner by engaging in professional development opportunities.